John Bowlby (1969) believed that attachment was an all or nothing process. However, research has shown that there are individual differences in attachment quality. Indeed, one of the primary paradigms in attachment theory is that of the security of an individual’s attachment (Ainsworth & Bell, 1970). Much research in psychology has focused on how forms of attachment differ among infants. For example, Schaffer and Emerson (1964) discovered what appeared to be innate differences in sociability in babies; some babies preferred cuddling more than others, from very early on, before much interaction had occurred to cause such differences. It’s easy enough to know when you are attached to someone because you know how you feel when you are apart from that person, and, being an adult, you can put your feelings into words and describe how it feels. However, most attachment research is carried out using infants and young children, so psychologists have to devise subtle ways of researching attachment styles, usually involving the observational method. Psychologist Mary Ainsworth devised an assessment technique called the Strange Situation Classification (SSC) in order to investigate how attachments might vary between children. The Strange Situation was devised by Ainsworth & Wittig (1969) and was based on Ainsworth’s previous Uganda (1967) and later Baltimore studies (Ainsworth et al., 1971, 1978). Mary Ainsworth's (1971, 1978) observational study of individual differences in attachment is described below. The security of attachment in one- to two-year-olds were investigated using the strange situation paradigm, in order to determine the nature of attachment behaviors and styles of attachment. Ainsworth developed an experimental procedure in order to observe the variety of attachment forms exhibited between mothers and infants. 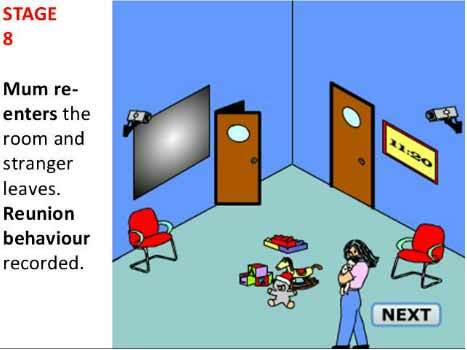 The experiment is set up in a small room with one way glass so the behavior of the infant can be observed covertly. Infants were aged between 12 and 18 months. The sample comprised of 100 middle-class American families. (1) Mother, baby, and experimenter (lasts less than one minute). (2) Mother and baby alone. (3) A stranger joins the mother and infant. (4) Mother leaves baby and stranger alone. (5) Mother returns and stranger leaves. (6) Mother leaves; infant left completely alone. (8) Mother returns and stranger leaves. Strange Situation classifications (i.e., attachment styles) are based primarily on four interaction behaviors directed toward the mother in the two reunion episodes (Ep. 5 & Ep. 8). The observer notes down the behavior displayed during 15-second intervals and scores the behavior for intensity on a scale of 1 to 7. Exploratory Behaviors e.g., moving around the room, playing with toys, looking around the room. 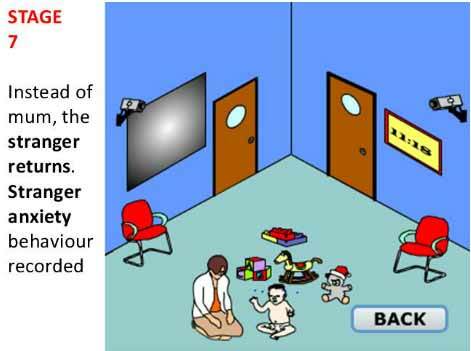 Search Behaviors, e.g., following mother to the door, banging on the door, orienting to the door, looking at the door, going to mother’s empty chair, looking at mother’s empty chair. Affect Displays negative, e.g., crying, smiling. Ainsworth (1970) identified three main attachment styles, secure (type B), insecure avoidant (type A) and insecure ambivalent/resistant (type C). She concluded that these attachment styles were the result of early interactions with the mother. A fourth attachment style known as disorganized was later identified (Main, & Solomon, 1990). Securely attached children comprised the majority of the sample in Ainsworth’s (1971, 1978) studies. Such children feel confident that the attachment figure will be available to meet their needs. They use the attachment figure as a safe base to explore the environment and seek the attachment figure in times of distress (Main, & Cassidy, 1988). Securely attached infants are easily soothed by the attachment figure when upset. Infants develop a secure attachment when the caregiver is sensitive to their signals, and responds appropriately to their needs. According to Bowlby (1980), an individual who has experienced a secure attachment 'is likely to possess a representational model of attachment figures(s) as being available, responsive, and helpful' (Bowlby, 1980, p. 242). Insecure avoidant children do not orientate to their attachment figure while investigating the environment. They are very independent of the attachment figure both physically and emotionally (Behrens, Hesse, & Main, 2007). They do not seek contact with the attachment figure when distressed. Such children are likely to have a caregiver who is insensitive and rejecting of their needs (Ainsworth, 1979). The attachment figure may withdraw from helping during difficult tasks (Stevenson-Hinde, & Verschueren, 2002) and is often unavailable during times of emotional distress. The third attachment style identified by Ainsworth (1970) was insecure ambivalent (also called insecure resistant). Here children adopt an ambivalent behavioral style towards the attachment figure. The child will commonly exhibit clingy and dependent behavior, but will be rejecting of the attachment figure when they engage in interaction. The child fails to develop any feelings of security from the attachment figure. Accordingly, they exhibit difficulty moving away from the attachment figure to explore novel surroundings. When distressed they are difficult to soothe and are not comforted by interaction with the attachment figure. This behavior results from an inconsistent level of response to their needs from the primary caregiver. Ainsworth (1978) suggested the ‘caregiver sensitivity hypothesis’ as an explanation for different attachment types. Ainsworth's maternal sensitivity hypothesis argues that a child’s attachment style is dependent on the behavior their mother shows towards them. ‘Sensitive’ mothers are responsive to the child's needs and respond to their moods and feelings correctly. Sensitive mothers are more likely to have securely attached children. In contrast, mothers who are less sensitive towards their child, for example, those who respond to the child’s needs incorrectly or who are impatient or ignore the child, are likely to have insecurely attached children. For example, securely attached infant are associated with sensitive & responsive primary care. Insecure ambivalent attached infants are associated with inconsistent primary care. Sometimes the child’s needs and met, and sometimes they are ignored by the mother / father. Insecure-avoidant infants are associated with unresponsive primary care. The child comes to believe that communication of needs has no influence on the mother/father. Ainsworth’s (1971, 1978) findings provided the first empirical evidence for Bowlby’s attachment theory. For example, securely attached children develop a positive working model of themselves and have mental representations of others as being helpful while viewing themselves as worthy of respect (Jacobsen, & Hoffman, 1997). Avoidant children think themselves unworthy and unacceptable, caused by a rejecting primary caregiver (Larose, & Bernier, 2001). Ambivalent children have a negative self-image and exaggerate their emotional responses as a way to gain attention (Kobak et al., 1993). Accordingly, insecure attachment styles are associated with an increased risk of social and emotional behavioral problems via the internal working model. This caregiver sensitivity theory is supported by research from, Wolff and Van Ijzendoorn (1997) who conducted a Meta-analysis (a review) of research into attachment types. They found that there is a relatively weak correlation of 0.24 between parental sensitivity and attachment type – generally more sensitive parents had securely attached children. However, in evaluation, critics of this theory argue that the correlation between parental sensitivity and the child’s attachment type is only weak. This suggests that there are other reasons which may better explain why children develop different attachment types and that the maternal sensitivity theory places too much emphasis on the mother. Focusing just on maternal sensitivity when trying to explain why children have different attachment types is, therefore, a reductionist approach. An alternative theory proposed by Kagan (1984) suggests that the temperament of the child is actually what leads to the different attachment types. Children with different innate (inborn) temperaments will have different attachment types. This theory is supported by research from Fox (1989) who found that babies with an ‘Easy’ temperament (those who eat and sleep regularly, and accept new experiences) are likely to develop secure attachments. Babies with a ‘slow to warm up’ temperament (those who took a while to get used to new experiences) are likely to have insecure-avoidant attachments. Babies with a ‘Difficult’ temperament (those who eat and sleep irregularly and who reject new experiences) are likely to have insecure-ambivalent attachments. In conclusion, the most complete explanation of why children develop different attachment types would be an interactionist theory. This would argue that a child’s attachment type is a result of a combination of factors – both the child’s innate temperament and their parent’s sensitivity towards their needs. Belsky and Rovine (1987) propose an interesting interactionist theory to explain the different attachment types. They argue that the child’s attachment type is a result of both the child’s innate temperament and also how the parent responds to them (i.e., the parents’ sensitivity level). Additionally, the child’s innate temperament may, in fact, influence the way their parent responds to them (i.e, the infants’ temperament influences the parental sensitivity shown to them). To develop a secure attachment, a ‘difficult’ child would need a caregiver who is sensitive and patient for a secure attachment to develop. The strange situation classification has been found to have good reliability. This means that it achieves consistent results. For example, a study conducted in Germany found 78% of the children were classified in the same way at ages 1 and 6 years (Wartner et al., 1994). Although, as Melhuish (1993) suggests, the Strange Situation is the most widely used method for assessing infant attachment to a caregiver, Lamb et al. (1985) have criticized it for being highly artificial and therefore lacking ecological validity. 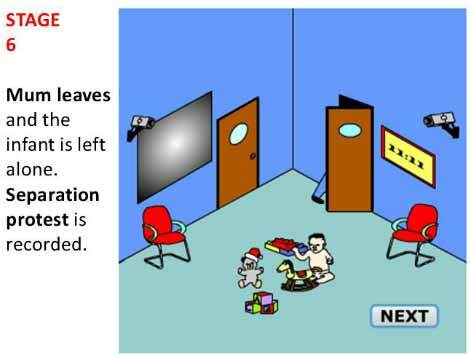 The child is placed in a strange and artificial environment, and the procedure of the mother and stranger entering and leaving the room follows a predetermined script. Mary Ainsworth concluded that the strange situation could be used to identify the child's type of attachment has been criticized on the grounds that it identifies only the type of attachment to the mother. The child may have a different type of attachment to the father or grandmother, for example (Lamb, 1977). This means that it lacks validity, as it does not measure a general attachment style, but instead an attachment style specific to the mother. In addition, some research has shown that the same child may show different attachment behaviors on different occasions. Children's attachments may change, perhaps because of changes in the child's circumstances, so a securely attached child may appear insecurely attached if the mother becomes ill or the family circumstances change. The strange situation has also been criticized on ethical grounds. Because the child is put under stress (separation and stranger anxiety), the study has broken the ethical guideline protection of participants. However, in its defense, the separation episodes were curtailed prematurely if the child became too stressed. 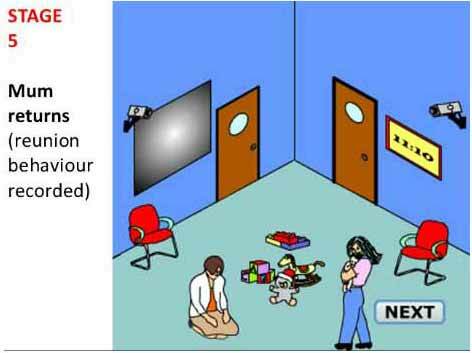 Also, according to Marrone (1998), although the Strange Situation has been criticized for being stressful, it is simulating everyday experiences, as mothers do leave their babies for brief periods of time in different settings and often with unfamiliar people such as babysitters. Finally, the study's sample is biased - comprising 100 middle-class American families. Therefore, it is difficult to generalize the findings outside of America and to working-class families. Ainsworth, M. D. (1964). Patterns of attachment behavior shown by the infant in interaction with his mother. Merrill-Palmer Quarterly of Behavior and Development, 51-58. Ainsworth, M. D. S. (1967). Infancy in Uganda: Infant care and the growth of love. Ainsworth, M. D. S., Bell, S. M., & Stayton, D. J. (1971) Individual differences in strange- situation behavior of one-year-olds. In H. R. Schaffer (Ed.) The origins of human social relations. London and New York: Academic Press. Pp. 17-58. Ainsworth, M. D. S., & Wittig, B. A. (1969). Attachment and exploratory behavior of one-year-olds in a strange situation. In B. M. Foss(Ed. ), Determinants of infant behavior (Vol. 4,pp. 111-136). London: Methuen. Behrens, K. Y., Hesse, E., & Main, M. (2007). Mothers' attachment status as determined by the Adult Attachment Interview predicts their 6-year-olds' reunion responses: A study conducted in Japan. Developmental Psychology, 43(6), 1553. Belsky, J., & Rovine, M. (1987). Temperament and attachment security in the strange situation: An empirical rapprochement. Child development, 787-795. Fox, N. A. (1989). Infant temperament and security of attachment: a new look. International Society for Behavioral Development, J yviiskylii, Finland. Jacobsen, T., & Hoffman, V. (1997). Children’s attachment representations: Longitudinal relations to school behavior and academic competency in middle childhood and adolescence. Developmental Psychology, 33, 703-710. Kagan, J., Reznick, J. S., Clarke, C., Snidman, N., & Garcia-Coll, C. (1984). Behavioral inhibition to the unfamiliar. Child development, 2212-2225. Kobak, R. R., Cole, H. E., Ferenz-Gillies, R., Flemming, W. S., & Gamble, W. (1993). Attachment and emotional regulation during mother-teen problem-solving. A control theory analysis. Child Development, 64, 231-245. Lamb, M. E. (1977). The development of mother-infant and father-infant attachments in the second year of life. Developmental Psychology, 13, 637-48. Larose, S., & Bernier, A. (2001). Social support processes: Mediators of attachment state of mind and adjustment in later late adolescence. Attachment and Human Development, 3, 96-120. Main, M., & Solomon, J. (1990). Procedures for identifying infants as disorganized/disoriented during the Ainsworth Strange Situation. In M.T. Greenberg, D. Cicchetti & E.M. Cummings (Eds. ), Attachment in the Preschool Years (pp. 121–160). Chicago, University of Chicago Press. Marrone, M. (1998). Attachment and interaction. Jessica Kingsley Publishers. Melhuish, E. C. (1993). A measure of love? An overview of the assessment of attachment. ACPP Review & Newsletter, 15, 269-275. Schaffer, H. R., & Emerson, P. E. (1964) The development of social attachments in infancy. Monographs of the Society for Research in Child Development, 29(3), serial number 94. Stevenson-Hinde, J., & Verschueren, K. (2002). Attachment in childhood. status: published. Thompson, R. A., Gardner, W., & Charnov, E. L. (1985). Infant-mother attachment: The origins and developmental significance of individual differences in Strange Situation behavior. LEA. Wartner, U. G., Grossman, K., Fremmer-Bombik, I., & Guess, G. L. (1994). Attachment patterns in south Germany. Child Development, 65, 1014-27. Wolff, M. S., & Ijzendoorn, M. H. (1997). Sensitivity and attachment: A meta‐analysis on parental antecedents of infant attachment. Child development, 68(4), 571-591.